We have argued the case for an exposure to the resources sector for over 12 months. Despite the excellent performance of the sector over this period, we continue to remain confident as our multi-pronged investment case remains intact. The initial foundation of our positive view on resources, and cyclical companies generally, is that global industrial production is growing strongly. 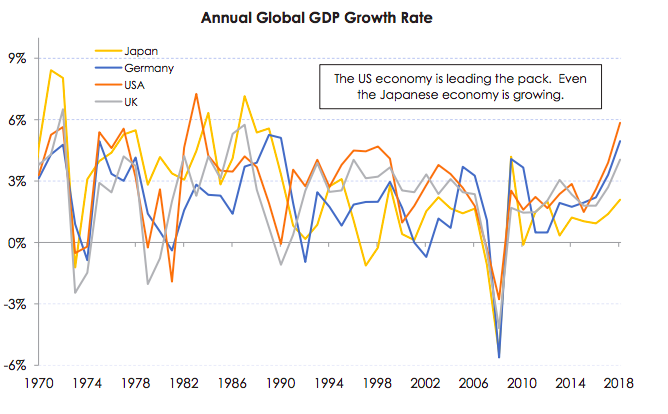 Every major global economy is experiencing robust economic conditions. This is a very positive backdrop for consumption of metals and other commodities. We expect this positive economic momentum to continue because financial conditions are likely to remain accommodative (interest rates remain low). Our interest rate view is predicated on a current lack of wage inflation as well as our observation that central banks seem unwilling to allow interest rates to increase materially in case it derails the global economic recovery. The other factor supporting our positive view on commodities is supply side discipline. Firstly, the Chinese government is dictating forced production cuts of major commodity groups – including aluminium, paper, concrete, steel and coal. This order is driven by the government’s objective of increasing the price of commodities to improve the profitability of these industries, as well as repair the environment. Adding to the supply side argument is the behaviour of major resource companies themselves. They are not responding to higher commodity prices with supply expansion plans. Just two years ago, the resources industry went through an existential crisis, with major companies like Glencore almost entering bankruptcy. This experience has left most Boards and Executive teams keen to reduce debt and reluctant to expand production. This behaviour is very supportive for commodity prices, and commodity companies. Strong demand from the economic cycle, and disciplined supply growth has been supportive for commodity prices over 2017. We expect more of the same over 2018. Major resource companies will likely continue delivering earnings upgrades, reducing debt and undertaking share buybacks and increasing dividends. All these outcomes are very supportive of equity values. The resources sector is not just a beneficiary of strong global demand and disciplined supply though. The future growth of the electric vehicle industry is creating new demand for some commodities. Our analysis suggests the growth of electric vehicles will see a greater requirement for lithium, nickel, cobalt, copper and rare earths. The total stock of vehicles on the world’s roads is estimated at 1.0 billion and forecast to rise to 1.2 billion by 2035. The average estimate for annual global passenger car sales is approximately 100 million. Based on global population growth and greater car ownership levels in developing countries such as China we forecast this number rising to 130 million per annum by 2025. 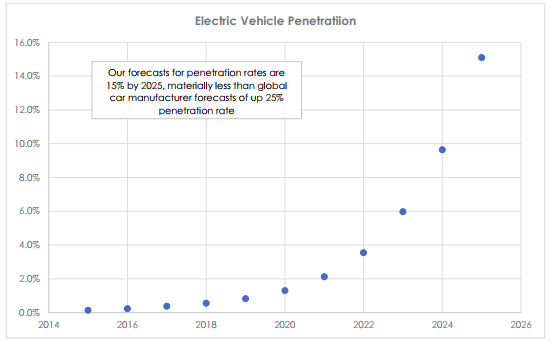 What is the likely penetration rate of electric vehicles? Government and automobile manufacturer targets point to at least a 15% penetration rate of electric vehicles by 2025. To move to this penetration rate, electric vehicle sales need to be 50 million per annum by 2025. The ramp up of electric vehicle production is unlikely to be linear. The diffusion and adoption of new ideas and new products often follows a S-shaped growth pattern, or an adoption curve. The pattern observed is driven by contagion akin to epidemic patterns. This model has predicted the growth of many things - cable television, IPhones, LED technology, computers, investment fads, and fashion. We expect electric car demand will follow a typical adoption curve, with growth driven initially by ‘innovators’ and ‘early adopters’ before being adapted by the ‘majority’. How much incremental metal is required for each electric vehicle? Nickel content is 0.60 kg per kWh or 18kg per electric car Based on our electric vehicle growth forecasts we expect incremental high-grade nickel sulphate demand to grow by 900,000 tonnes per annum by 2025. This compares to current production of high-grade nickel of approximately 1.1 million tonnes. The nickel price required to incentivise this new production is above $US 12 per pound, almost double the current nickel price of $US6.30 per pound. If we assume nickel rises to this price over the next few years, Australian nickel producer Independence Group (IGO) is worth up to $8.50, 70% above the current share price. Lithium content is currently 1 kg for each kWh, going to 0.5 kg/kwh by 20253, or 30kg per electric car. Based on our electric vehicle growth forecasts, we expect lithium demand to grow to 1 million tonnes per annum. This compares to current production of about 200k tonnes per annum. The current price of $US14,000 per tonne is elevated, and is likely to remain so for several years until supply responds to the high price. Copper content is currently 45kg per electric vehicle, or 25kg more than a conventional vehicle. Based on our electric vehicle growth forecasts we expect copper demand to grow by an incremental 1.1 million tonnes per annum. This compares to current production of about 22 million tonnes per annum. 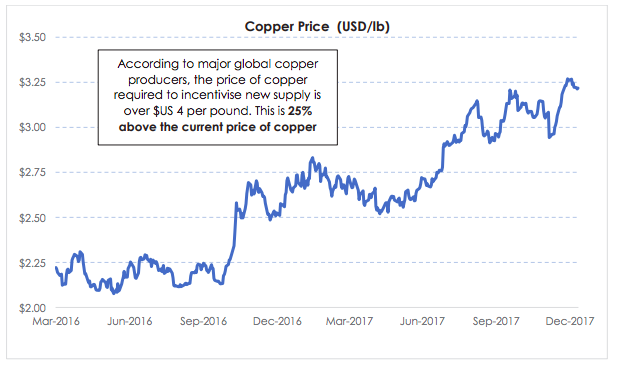 The copper price required to incentivise this new production is above $US 4.00 per pound, 25% above the current copper price of $US 3.25 per pound. I notice you have no advice on Graphite, which is also a key component of batteries. 1kg per kwh. Would it be possible to do an analysis of the graphite sector? Cheers, Love your work.